March 6 (Bloomberg) -- The yen headed for a sixth week of declines against the dollar on concern that Japan’s political turmoil and economic slump are worsening, reducing the appeal of the currency. The yen was poised for its longest losing streak versus the greenback in nine months after local media reported Japanese prosecutors suspect a group headed by Trade Minister Toshihiro Nikai of taking illegal political donations. The dollar traded near a three-month high against the euro on speculation a slide in stocks will increase demand for the relative safety of the U.S. currency. “Political uncertainty seems to be mounting and the economy isn’t showing any signs at all of improving,” said Ryohei Muramatsu, Tokyo-based manager of Group Treasury Asia at Commerzbank AG, Germany’s second-largest lender. “The yen is likely to be sold” to 99 against the dollar and 124.10 per euro today, he said. The yen traded at 98.09 against the dollar as of 11:40 a.m. in Tokyo from 98.07 late in New York yesterday, and down from 97.57 late last week in New York, heading for a 0.5 percent weekly drop. Japan’s currency declined to 123.26 per euro from 123.00 yesterday. Europe’s single currency traded at $1.2562 from $1.2540 late in New York yesterday. It was at 88.72 British pence from 88.82 pence. The pound rose to $1.4160 from $1.4118 and the Swiss franc climbed to 1.1677 from 1.1713. The yen fell against 14 of the 16 major currencies today on concern Japan’s political turmoil will make it harder for the government to cope with a deepening recession. Finance Minister Kaoru Yosano said today the nation’s economic data has been “much worse” than expected and the government will need to revise its gross domestic product forecast soon. Japanese machinery orders may have slumped 40.2 percent in January from a year earlier, according to a Bloomberg News survey of economists before the March 11 report. The world’s second-biggest economy shrank an annualized 12.7 percent last quarter, the government said Feb. 16, the biggest contraction since the 1974 oil crisis. Nikai told reporters in Tokyo today he had no knowledge of an investigation into one of his political groups over suspected campaign donations and had done nothing wrong. Prosecutors suspect a group he headed received donations from Nishimatsu Construction Co., the Sankei newspaper reported today, without saying where it got the information. The yen will fall to 102 against the dollar as risk sentiment improves and a weakening domestic economy prompts investors to buy assets outside Japan, Barclays Capital said. The currency has lost 8.8 percent since strengthening to 87.12 per dollar on Jan. 21, the highest since 1995, as investors sold higher-yielding assets to repay low-cost borrowings in Japan. The yen will weaken 4 percent against the greenback over the next three months, Barclays said, revising last month’s forecast for the currency to strengthen to 86. The Dollar Index, which the ICE uses to track the greenback against the currencies of six major U.S. trading partners, headed for a fourth weekly advance after U.S. and Asian stocks slumped, encouraging investors to seek shelter from the financial turmoil. The Dollar Index gained 1.1 percent this week to 88.955 after JPMorgan Chase & Co., the second-largest U.S. bank, had its rating outlook cut to negative from stable. The Standard & Poor’s 500 Index dropped 4.3 percent yesterday to the lowest level since 1996 and the MCSI Asia Pacific Index of regional shares fell 1.7 percent today, set for a fourth week of declines. The greenback advanced against 12 of the 16 major currencies before a U.S. Labor Department report today that economists say will show a 14th month of job losses, also prompting investors to reduce holdings of riskier assets. U.S. employers cut 650,000 jobs in February, and the unemployment rate surged to 7.9 percent, according to the median forecasts in Bloomberg News surveys of analysts. The Labor Department’s payroll report is due at 8:30 a.m. in Washington. March 5 (Bloomberg) -- Crude oil fell after China quelled speculation that the government will add to its stimulus plan and Goldman Sachs Group Inc. said the global recession is worsening. Oil dropped 3.9 percent after Chinese Premier Wen Jiabao said today that the country’s 8 percent growth target for this year is within reach, indicating he doesn’t see the need to increase spending. Commodities surged yesterday on signs that Wen would announce a new program. Goldman Sachs forecast that the world economy will shrink 0.6 percent this year. Crude oil for April delivery fell $1.77 to settle at $43.61 a barrel at 2:49 p.m. on the New York Mercantile Exchange. Prices are down 2.2 percent so far this year. Orders placed with U.S. factories fell in January for a sixth consecutive month, reflecting a pullback in business spending that will probably deepen what may become the worst recession in seven decades. Bookings declined 1.9 percent, less than forecast, after a revised 4.9 percent drop in December, the Commerce Department said today in Washington. A Labor Department report showed that 639,000 Americans made first-time unemployment applications. It was the fifth week that more than 600,000 Americans filed first-time claims for benefits. The Standard & Poor’s 500 Index fell to the lowest level since 1996. The S&P 500 lost 4.4 percent to 681.42 at 3:25 p.m., and reached 681.81 earlier today. “The economic environment overall is still likely to remain challenging and uncertainty is high,” Goldman’s London-based economist Binit Patel said today in a report to clients. He had previously forecast a 0.2 percent decline this year. The Organization of Petroleum Exporting Countries, due to meet again on March 15, cut output by 2.7 percent in February, a Bloomberg News survey showed. OPEC production averaged 27.78 million barrels a day last month, down 770,000 from January, according to the survey of oil companies, producers and analysts. OPEC will reduce crude-oil shipments by 1.9 percent in the month ending March 21, according to Oil Movements. Members will load 22.67 million barrels a day in the period, down from 23.1 million a day in the month ended Feb. 21, the Halifax, England- based based tanker tracker said in a report today. “You aren’t going to see prices move much higher until there is clear evidence that the drop in the economy is over and OPEC cuts are working well enough to control inventories,” said Adam Sieminski, the chief energy economist at Deutsche Bank AG in Washington. Crude oil supplies in the U.S. fell 757,000 barrels to 350.6 million barrels in the week ended Feb. 27, the Energy Department said in a report yesterday. Inventories were forecast to rise by 1 million barrels, according to the median of analyst estimates in a Bloomberg News survey. Stockpiles at Cushing, Oklahoma, where New York-traded West Texas Intermediate crude is delivered, declined 553,000 barrels to 34 million barrels last week, the report showed. Inventories in the week ended Feb. 6 were the highest since at least April 2004, when the department began keeping records for the location. The drop in Cushing supplies has narrowed the discount of WTI to the U.K.’s Brent oil. Brent crude oil for April settlement declined $2.48, or 5.4 percent, to end the session at $43.64 a barrel on London’s ICE Futures Europe exchange. The discount of oil in New York to Brent weakened to 3 cents a barrel, the lowest since Dec. 11 when the U.S. futures last traded at a premium. “I do not believe we will see $100-per-barrel oil for many years to come,” Fadel Gheit, director of oil and gas research at Oppenheimer & Co. in New York, said on Bloomberg Television. “The bubble has burst.” Oil touched a record $147.27 a barrel in July. U.S. gasoline consumption averaged 9 million barrels a day over the past four weeks, up 2.2 percent from a year earlier, yesterday’s Energy Department report showed. Gasoline futures for April delivery fell 6.89 cents, or 5 percent, to $1.3127 a gallon in New York. It was the biggest drop since Feb. 17. The average U.S. pump price for regular gasoline was unchanged at $1.933 a gallon, AAA, the nation’s largest motorist organization, said on its Web site. Prices have declined 53 percent from the record $4.114 a gallon reached in July. Crude oil volume in electronic trading on the exchange was 439,007 contracts as of 3:06 p.m. in New York. Volume totaled 634,640 contracts yesterday, 17 percent higher than the average over the past three months. Open interest was 1.21 million contracts yesterday. The exchange has a one-business-day delay in reporting open interest and full volume data. March 5 (Bloomberg) -- Gold futures rose, snapping an eight- session slump, as some investors purchased the precious metal as an alternative to stocks. Silver climbed. European equities fell after rebounding from a 12-year low yesterday, and U.S. stocks headed for the fourth straight weekly decline. Gold dropped 9.5 percent in the previous eight sessions, the longest slump since September. On Feb. 20, the metal topped $1,000 an ounce for the first time in 11 months. Gold futures for April delivery rose $21.10, or 2.3 percent, to $927.80 on the Comex division of the New York Mercantile Exchange. Silver futures for May delivery climbed 20.5 cents, or 1.6 percent, to $13.12 an ounce. Gold has gained 4.9 percent this year, while silver jumped 16 percent. This week, the Dow Jones Industrial Average dropped below 7,000, the lowest level since 1997. Banks seized homes at a record pace in the fourth quarter as unemployment rose to a 15- year high. Mortgage delinquencies increased to a seasonally adjusted 7.9 percent of all loans, the highest in records going back to 1972, the Mortgage Bankers Association said today. Loans in foreclosure rose to 3.3 percent, also an all-time high. “Investors are buying gold due to financial-market fears,” said Jeffrey Christian, a managing director at CPM Group in New York. Since the second quarter of 2007, banks worldwide posted almost $1.2 trillion in writedowns and losses related to the credit crisis. Shares of Citigroup Inc., once the world’s biggest bank by market value, dropped below $1 today. “We continue to think investors should own gold as a hedge against the increased riskiness of other assets,” analysts at Jefferies Group Inc. said in a report. Gold denominated in other currencies may gain as central banks slash borrowing costs to stimulate their economies. The Bank of England lowered its benchmark rate to 0.5 percent and the European Central Bank cut its rate to 1.5 percent. In the U.S., the federal-funds rate is zero to 0.25 percent. Last month, gold priced in euros and pounds rose to records. Comex futures reached an all-time high of $1,033.90 almost a year ago. The price climbed to $1,007.70 on Feb. 20. Gold producers will have “tremendous” profits this year as the metal remains near a record and mining costs decline, said John Hathaway, the managing director of Tocqueville Asset Management LP. March 6 (Bloomberg) -- The dollar traded near a three-month high against the euro on speculation a slide in stocks will prompt investors to reduce holdings of riskier assets. The greenback headed for its fourth weekly gain versus the euro before a Labor Department report today that economists say will show a 14th month of job losses, also boosting demand for the relative safety of the dollar. The euro was poised for a weekly loss versus the yen after European Central Bank President Jean-Claude Trichet yesterday signaled further cuts in the main refinancing rate after reducing it to a record low. The dollar traded at $1.2543 per euro as of 8:17 a.m. in Tokyo, from $1.2540 late in New York yesterday. It reached $1.2457 on March 4, the strongest since Nov. 21. The yen was at 123.09 from 123.00 per euro yesterday. Japan’s currency traded at 98.14 per dollar from 98.07 late in New York yesterday. The dollar was at $1.4117 per pound, from $1.4118, and traded at 1.1710 Swiss francs from 1.1713. The Dollar Index, which the ICE uses to track the greenback against the currencies of six major U.S. trading partners, gained 0.6 percent yesterday to 89.105 as investors sought refuge from global financial turmoil. Stocks in the U.S. and Europe tumbled after JPMorgan Chase & Co., the second-largest U.S. bank, had its rating outlook cut to negative from stable. The Standard & Poor’s 500 Index dropped 4.3 percent to the lowest level since 1996 and Europe’s Dow Jones Stoxx 600 Index declined 3.6 percent. The euro may extend losses versus the greenback after ECB President Trichet yesterday signaled further cuts in the main refinancing rate after lowering it to 1.5 percent. The Bank of England also reduced its main rate by a half-percentage point to the all-time low of 0.5 percent and said it will pump cash into the economy by purchasing as much as 150 billion pounds ($212 billion) in government and corporate bonds. FKLI March futures contract fall 4 lower to close at 868 as compare to previous trading session with total 7336 lots traded in the market. FKLI was traded lower during the trading day despite Dow Jones overnight strong closing. Technically, FKLI seems temporary top around resistance levels at 872 regions and downtrend channel seems form in the hourly price chart. We expect FKLI would trade lower in the coming trading session provided resistance levels at 900 and 914 were not violated. Traders were advice to hold short position in the coming trading session while be cautious around support levels at 865 and 858 region. FCPO 3rd month May Futures contract rise marginally RM4 higher to close at RM1906 as compare to previous trading session with 6099 lots traded in the market. CPO price was traded wild during the trading days as soybean oil and crude oil retrace after strong overnight closing. 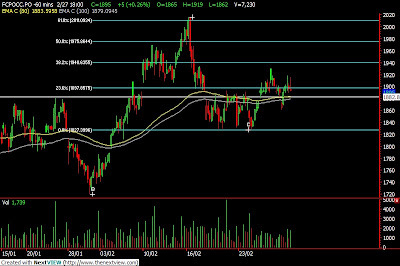 Technically, CPO price seems topped around resistance levels at RM1915; 78.6% Fibonacci retracement levels. We expect CPO price would have further profit taking activities in the coming trading session provided support levels at RM1890 and RM1860 were not violated. However, traders were still advice to hold long position in the coming trading session while be cautious around resistance levels around RM1920 and RM1945 regions. MUMBAI, March 5 (Reuters) - India soybean and rapeseed futures edged up on Thursday tracking firm demand in the spot market and on gains in Malaysian palm oil, but higher arrivals of winter-sown oilseeds limited the gains, analysts said. At 2:38 p.m., April soybean NSBJ9 on the National Commodity and Derivatives Exchange was up 0.22 percent at 2,323.5 rupees per 100 kg. Prices in the spot market in Indore, a hub for soybean trade in India, rose 1.35 percent to 22,600 rupees per tonne. Demand for rapeseed rose as millers bought heavily to meet their annual requirements. But higher arrivals limited the gains. Rapeseed arrivals in Rajasthan, the largest producer, rose to over 315,000 bags of about 85 kg on Thursday, up from about 240,000 bags in the previous session, traders said. June rapeseed futures NRSM9 was up 0.83 percent at 459 rupees per 20 kg. Firm Malaysian palm oil supported local prices. March 5 (Bloomberg) -- Crude oil rose for a third day in New York, extending yesterday’s surge, as China said it will “significantly increase” investment this year to boost its economy, potentially draining ample supplies of the fuel. Oil climbed 9 percent yesterday after an official said Chinese Premier Wen Jiabao may announce new measures to spur expansion, adding to a 4 trillion yuan ($585 billion) spending plan. A U.S. government report yesterday showed an unexpected decline in crude-oil inventories last week as OPEC cut production. Crude oil for April delivery rose 22 cents, or 0.5 percent, to $45.60 a barrel at 11:26 a.m. Sydney time on the New York Mercantile Exchange. Yesterday, futures rose $3.73 to $45.38. Prices are up 1.7 percent so far this year. Wen will announce “a new stimulus package” in his annual address to the nation’s legislature, former statistics bureau head Li Deshui said in Beijing yesterday. China will boost spending in 2009 to counter a slowdown in the world’s third-biggest economy, Wen said in the work report, delivered today. China is the second-biggest oil consumer after the U.S.
Bank of Japan board member Miyako Suda said yesterday the central bank should signal that it’s prepared to take “bold” measures to counter the recession. Japan’s lower house of parliament approved a bill that will free up about 5 trillion yen ($50 billion) for economic stimulus. Commodities yesterday had their biggest increase since Dec. 31. The Reuters/Jefferies CRB Index of 19 raw materials rose 7.78, or 3.8 percent, to 211.45. Crude oil supplies fell 757,000 barrels to 350.6 million barrels in the week ended Feb. 27, the Energy Department said in a report yesterday. Inventories were forecast to rise 1 million barrels, according to the median of analyst estimates in a Bloomberg News survey. The high inventories at Cushing have depressed the West Texas price so that Brent crude oil traded in London is at a premium to the U.S. grade. Brent crude oil for April settlement increased $2.42, or 5.5 percent, to settle at $46.12 a barrel on London’s ICE Futures Europe exchange yesterday. Oil traded in New York’s discount to the Brent grade narrowed to 74 cents a barrel, the lowest since Jan. 2. The price of oil on Nymex for delivery in May is $1.75 a barrel higher than for April, down from a $1.82 premium yesterday. Traders who purchase oil today can sell contracts for delivery in later months at a higher price, a condition known as contango. The Organization of Petroleum Exporting Countries, due to meet again on March 15, cut output by 2.7 percent in February, a Bloomberg News survey showed. OPEC production averaged 27.78 million barrels a day last month, down 770,000 from January, according to the survey of oil companies, producers and analysts. Output in January was revised 20,000 barrels a day lower. The survey showed the 11 OPEC members with output quotas, all except Iraq, produced 545,000 barrels a day above the target of 24.85 million barrels a day. The countries pumping the most over their quotas were Iran, Angola and Libya. Refineries operated at 83.1 percent of capacity, up 1.8 percentage points from the prior week, the Energy Department report showed. Analysts were split over whether there was an increase or decline. Gasoline inventories rose 168,000 barrels to 215.5 million barrels, the report showed. Analysts forecast that supplies would decline 800,000 barrels. March 4 (Bloomberg) -- Soybeans rose the most in more than three weeks and corn gained on speculation that demand for food and livestock feed will improve as China boosts government spending in a bid to spur economic growth. Premier Wen Jiabao will announce a new stimulus package tomorrow, said Li Deshui, a former central bank policy maker. China’s manufacturing index rose for a third month in February, adding to evidence that spending is reviving growth. The country is the world’s biggest consumer of grain and oilseeds. Soybean futures for May delivery rose 15 cents, or 1.8 percent, to $8.685 a bushel on the Chicago Board of Trade, the biggest gain for a most-active contract since Feb. 6. The price still is down 47 percent since reaching a record $16.3675 on July 3 and touched an 11-week low of $8.3825 on March 2. Corn futures for May delivery rose 13 cents, or 3.7 percent, to $3.635 a bushel in Chicago, the biggest gain in a week. Still, the price has tumbled 55 percent from an all-time high of $7.9925 on June 27. The Reuters/Jefferies CRB Index of 19 commodities rose 3.8 percent, the most this year, led by gains of 9 percent for crude oil and 5.6 percent for copper. The index fell Feb. 24 to the lowest since June 2002. China Investment Corp., the $200 billion sovereign wealth fund, may invest in “undervalued” commodity assets, joining other Chinese companies in taking advantage of a six-year low in prices, Executive Vice President Jesse Wang told reporters today in Beijing. The Baltic Dry Index, a measure of shipping costs for commodities, posted a fourth consecutive advance on the Baltic Exchange, suggesting improved commodity demand, analysts said. The index, after dropping 92 percent last year, has more than doubled since Dec. 24. Corn and soybeans also rose as Argentine farmers and the government fight over export taxes and the possible creation of a state-controlled agency to regulate grain trading, Huckabay said. Argentina is the biggest exporter of animal feed and cooking oil made from soybeans and the second-biggest exporter of corn after the U.S.
Argentina’s government yesterday agreed to raise the quota for beef exports, eliminate dairy-export taxes and increase the minimum price at which it will buy wheat. Farmers are scheduled to meet again with the government on March 10 as they seek an agreement on reducing a 35 percent tax on soybean exports and removal of export restrictions on other farm goods. Last year, the country’s farm groups stopped selling grain and blocked highways during a four-month protest against tax increases and a ban on shipping beef abroad. The move prompted food shortages and higher consumer prices, pushing President Cristina Fernandez de Kirchner’s popularity rating to its lowest ever. “U.S. soybean meal and soy-oil are competitively priced relative to Argentina and Brazil,” Huckabay said. Corn is the biggest U.S. crop, valued at $47.4 billion in 2008, following by soybeans at $27.4 billion, government figures show. March 5 (Bloomberg) -- The yen traded near the weakest level in almost four months against the dollar after a government report showed Japanese companies slashed spending at the fastest pace in a decade, damping demand for the currency. The euro may decline versus the greenback before a policy meeting where economists say the European Central Bank will lower its main refinancing rate to a record low 1.5 percent. The dollar gained versus 14 of the 16 major currencies before a Labor Department report tomorrow that may show the U.S. cut payrolls by 650,000 in February, the most since 1949. “Recently the sensitivity is high to bad data so the yen will be under pressure and the risk is for the downside,” said Masafumi Yamamoto, head of foreign-exchange strategy for Japan at Royal Bank of Scotland Group Plc in Tokyo and a former Bank of Japan currency trader. “The yen bear trend will continue” and the currency may test 100 per dollar today, he said. The yen traded at 99.01 versus the greenback as of 8:54 a.m. in Tokyo, after touching 99.49 yesterday, the weakest level since Nov. 10. It was at 125.18 against the euro from 125.52 late in New York yesterday. The dollar traded at $1.2643 per euro from $1.2661. Spending by Japanese businesses on capital equipment excluding software slid 18.1 percent in the fourth quarter, the steepest decline since the three months ended Dec. 31, 1998, according to the Ministry of Finance. Economists surveyed by Bloomberg News forecast a 15.3 percent decline. Japan’s currency fell 7.9 percent versus the dollar in February, the biggest monthly decline since August 1995, after reports showed the economy shrank last quarter by the most since 1974 and the trade deficit increased in January to the widest since at least 1980. The ECB will cut its 2 percent target lending rate today by a half-percentage point to the lowest level since the 16- nation currency was introduced in 1999, according to the median forecast of analysts surveyed by Bloomberg News. The Bank of England will halve its main rate to 0.5 percent, according to a separate Bloomberg survey. FKLI February futures contract rebound 9 higher to close at 872 as compare to previous trading session with total 5511 lots traded in the market. FKLI was traded higher during the trading session tracking closely with regional indices and Dow Jones futures electronic trading especially Chine Stock Exchange and Hang Seng Stock exchange. 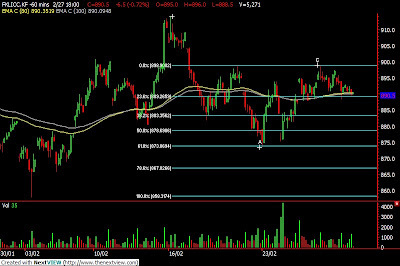 Technically, FKLI seems well supported above support levels at 860 region; 78.6% Fibonacci retrace figures. 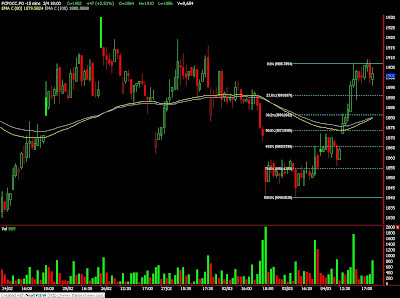 We expect FKLI would top around resistance levels at 876 and 888 regions. 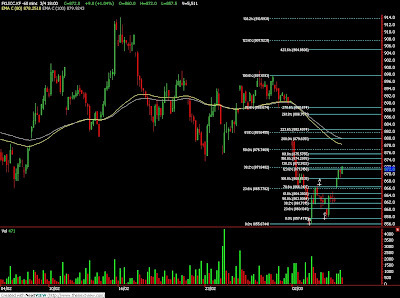 Traders were advice to do hold short position around the resistance levels while be alert around support levels at 865 and 858 region as downtrend is underway. FCPO 3rd month May Futures contract surge RM47 higher to close at RM1902 as compare to previous trading session with 9654 lots traded in the market. CPO price surge up during 2nd trading session due to crude oil and soybean oil electronic trading. Technically, CPO price break up from a flag formation in the 15 minute price chart after holding well above RM1855; 61.8% Fibonacci retrace figure during the morning session. We expect CPO price would trade higher in the coming trading session with support levels seen at RM1880 and RM1865 region. Traders were advice to hold long position in the coming trading session while be cautious around resistance levels at RM1910 and RM1945 region. The greenback climbed versus all 16 most-active currencies as Australia’s gross domestic product shrank 0.5 percent in the fourth quarter from the previous three months, compared with economists’ estimates for 0.2 percent growth. The Dollar Index rose to the strongest since April 2006 on speculation Federal Reserve officials today will reiterate the need to expand aid to the banking system. The dollar climbed to $1.2474 per euro as of 10:45 a.m. in Tokyo from $1.2561 late in New York yesterday. It reached $1.2457, the highest since Nov. 21. The greenback traded at 98.27 yen from 98.16 yen. The U.S. currency rose to $1.4009 from $1.4050 against the British pound and advanced to 1.1811 Swiss francs from 1.1760. The yen strengthened to 122.74 per euro from 123.31. Japan’s currency rose 1 percent to 15.96708 versus South Korea’s won and advanced 1 percent to 61.97 against Australia’s dollar from late in New York yesterday. The U.S. currency gained for a fourth day against the euro on speculation Dallas Fed President Richard Fisher and Atlanta Fed President Dennis Lockhart will today reiterate the need to increase financial assistance to the banking system. Fed Chairman Ben S. Bernanke said yesterday in testimony prepared for the Senate Budget Committee that policy makers may have to expand aid to the banking system beyond the $700 billion already approved and take other measures even at the cost of soaring fiscal deficits. March 3 (Bloomberg) -- OPEC, which pumps more than 40 percent of the world’s oil, cut output for a seventh consecutive month in February as producers tried to stem price declines, a Bloomberg News survey showed. Production from the 12-member group averaged 27.775 million barrels a day, down 770,000, or 2.7 percent, from January, according to the survey of oil companies, producers and analysts. Output in January was revised 20,000 barrels a day lower. Cuts were led by Saudi Arabia, the biggest producer in the Organization of Petroleum Exporting Countries, which reduced output by 165,000 barrels to an average 7.86 million barrels a day. It was the first time Saudi production dropped below 8 million barrels a day since November 2002. “They’ve definitely done more than I thought they would have, but on the flip side of that, there’s a lot of spare capacity to meet any sort of disruptions, and that’s one reason why a sustained rally isn’t likely,” said Kyle Cooper, an analyst at IAF Advisors, an energy consultant in Houston. Oil futures for April delivery rose $1.50, or 3.7 percent, to $41.65 a barrel at 2:45 p.m. today on the New York Mercantile Exchange after dropping 10 percent yesterday. Crude has fallen 72 percent since reaching a record $147.27 a barrel on July 11. Production cuts have left OPEC with 6.725 million barrels a day of spare capacity, including an estimated 2.94 million barrels in Saudi Arabia, the survey showed. OPEC members with output quotas, all except Iraq, pumped 25.390 million barrels a day in February, 545,000 barrels more than their target of 24.845 million. The figure was 790,000 barrels a day below a revised January production level of 26.18 million barrels a day. Only Saudi Arabia, Kuwait, the United Arab Emirates and Qatar producing less than their targets last month, the survey showed. OPEC oil ministers agreed Dec. 17 in Oran, Algeria, to reduce supply by 9 percent as crude-oil prices headed for their first annual decline since 2001. Iraq pumped 2.385 million barrels a day last month, 20,000 barrels a day more than in January. Iraq was the only OPEC member to increase output. Iran, OPEC’s second-biggest producer, cut output by 90,000 barrels to 3.69 million barrels a day. The country exceeded its output target by 354,000 barrels, the most of any OPEC member. Kuwait cut output by 140,000 barrels to 2.14 million barrels a day, the second-biggest reduction, after Saudi Arabia. Venezuelan oil output slipped 85,000 barrels to an average 2.065 million barrels a day in February, 79,000 barrels a day above its target. Nigerian production fell 45,000 barrels a day to an average 1.765 million barrels a day, 92,000 barrels a day above its target. Angola pumped 1.67 million barrels a day last month, down 70,000 from January and 153,000 barrels above its production target, making its compliance the second-worst after Iran in terms of actual barrels. Libyan output lost 25,000 barrels a day to 1.605 million, 136,000 barrels a day over its target. Algeria produced 1.245 million barrels, down 30,000 barrels from January and 42,000 barrels over its target. Qatar’s production dropped 30,000 barrels to an average 695,000 barrels a day, 36,000 barrels a day under its target. Ecuador produced 445,000 barrels a day, down 30,000 barrels from January and 11,000 barrels over its target. MUMBAI, March 3 (Reuters) - Indian soyoil futures edged up on Tuesday on low arrivals in the spot market ahead of festivals this month, but weakness in Malaysian palm oil and a rise in supplies of rival rapeseed oil limited gains. At 3:19 p.m. (0949 GMT), the March futures NSOH9 contract was up 0.7 percent at 446.8 rupees ($8.6) per 10 kg on the National Commodity and Derivatives Exchange. The April contract NSOJ9 had risen 0.98 percent to 443.7 rupees. Soyoil prices in the spot market in Indore, a hub for soyoil trade in India, was steady on limited selling at lower prices. "Indian demand has improved and prices may remain slightly firm in the short term. But a rise in edible oil supplies in coming days may weigh on the markets," a trader in Indore said. Rapeseed oil, which is produced from rapeseed, has started entering the local market and higher supplies are expected in the coming weeks following a sharp rise in oilseed supplies, traders in the western state of Rajasthan said. Arrivals of rapeseed in Rajasthan, the largest producer, were steady at 300,000 bags of about 85 kg, sharply higher than arrivals in the same period last year. Lower prices of rival palm oil overseas weighed on the market. May palm oil futures KPOc3 on Bursa Malaysia Derivatives Exchange were down 0.48 percent to 1,862 ringgit a tonne at 0949 GMT. March 3 (Bloomberg) -- Oil gained, after dropping 10 percent yesterday, on speculation OPEC may take further steps to support prices at its meeting later this month. The Organization of Petroleum Exporting Countries, implementing its biggest-ever supply cut, will devise a “solution” to boost oil prices when it meets on March 15, Iran’s oil minister said. The group supplies 41 percent of the world’s oil. Royal Dutch Shell Plc said it shut some production in Nigeria after a pipeline was attacked over the weekend. “OPEC will try to chat this market up the best they can, but it’s still probably a month or two away from these production cuts having any bite,” said Jim Ritterbusch, president of Ritterbusch & Associates, a Galena, Illinois, energy consultant. He forecast OPEC may cut another 500,000 barrels to 1 million barrels a day at its meeting. Crude oil for April delivery rose $1.50, or 3.7 percent, to settle at $41.65 a barrel at 2:45 p.m. on the New York Mercantile Exchange. The price has fallen 59 percent in the past 12 months. Yesterday, futures plunged $4.61 to $40.15 a barrel, the biggest one-day drop since Jan. 7, after global equity markets slumped on reports of manufacturing declines in China and the U.S. Prices are down 6.6 percent so far this year. OPEC members “will review the situation of the market on March 15 in Vienna and introduce a new solution to improve oil prices,” Iran’s oil minister, Gholamhossein Nozari, told the official Islamic Republic News Agency. OPEC cut output by 2.7 percent in February as producers tried to stem price declines, a Bloomberg News survey showed. Production from the 12-member group averaged 27.775 million barrels a day last month, down 770,000 from January, according to the survey of oil companies, producers and analysts. Output in January was revised 20,000 barrels a day lower. Earlier today, crude fell below $40 a barrel in New York as equities declined following remarks by U.S. Federal Reserve Chairman Ben S. Bernanke. The Fed chief said policy makers may need to provide more aid to the banking system beyond $700 billion already approved and take other measures to restore financial stability. Crude oil volume in electronic trading on the exchange was 384,821 contracts as of 3:12 p.m. in New York. Volume totaled 433,678 contracts yesterday, the lowest since Jan. 30 and 19 percent below the three-month average. Open interest was 1.19 million contracts. The exchange has a one-business-day delay in reporting open interest and full volume data. Gasoline for April delivery rose 3.32 cents, or 2.6 percent, to $1.3194 a gallon on the Nymex. Heating oil for April delivery added $2.84, or 2.5 percent, to $1.1796 a gallon. U.S. oil supplies probably rose last week as imports climbed and refineries ramped up operating rates, a Bloomberg News survey showed. Crude-oil stockpiles increased 1 million barrels in the week ended Feb. 27 from 351.3 million the week before, according to the median of 12 estimates by analysts. The Energy Department is scheduled to release its weekly report at 10:30 a.m. tomorrow in Washington. The industry-funded American Petroleum Institute said supplies fell 463,000 barrels to 345.7 million barrels a day last week, in a report that was released at 4:30 p.m. in Washington. “With OPEC cutting and the refiners operating at low levels, any builds that we’re seeing are really indicating poor demand,” said Victor Shum, a senior principal at consultants Purvin & Gertz Inc. in Singapore. Refineries probably operated at 81.4 percent of capacity, little changed from the week before, the survey showed. Gasoline stockpiles probably dropped 550,000 barrels from 215.3 million in the prior week, according to the survey. Supplies of distillate fuel, a category that includes heating oil and diesel, probably fell 1 million barrels from 141.6 million. OPEC “will likely” reduce supplies to support prices, Algerian Oil Minister Chakib Khelil said in an interview in Madrid yesterday. OPEC members have reached almost 100 percent compliance with existing cuts at the end of February, Khelil said. Today’s Bloomberg survey showed the 11 OPEC members with output quotas, all except Iraq, produced 545,000 barrels a day above the target of 24.845 million barrels a day. The countries pumping the most over their targets were Iran, Angola and Libya. Brent crude oil for April settlement rose $1.49, or 3.5 percent, to $43.70 a barrel on London’s ICE Futures Europe exchange. It declined 8.9 percent yesterday. March 4 (Bloomberg) -- The dollar traded near the highest level since April 2006 against six of the major currencies after Federal Reserve Chairman Ben S. Bernanke said policy makers may need to expand aid to the banking system. The U.S. currency may climb for a fifth day against the euro before a private sector survey today that may show the U.S. lost jobs for a 13th straight month in February, boosting demand for the dollar as a shelter from the financial crisis. The yen traded near the weakest since November against the dollar after Bank of Japan Governor Masaaki Shirakawa yesterday said the Japanese economy is worsening faster than the central bank expected, reducing the appeal of Japan’s currency. The dollar climbed to $1.2530 per euro as of 8:16 a.m. in Tokyo from $1.2561 late in New York yesterday. The yen was at 123.35 per euro from 123.31. The U.S. currency rose to 98.44 from 98.16 yen. The Dollar Index, which the ICE uses to track the greenback versus the euro, yen, pound, Swiss franc, Canadian dollar and Swedish krona, gained as much as 0.4 percent yesterday to 89.327, the highest level since April 2006, as investors took refuge in the world’s reserve currency. “The dollar should continue to remain supported as the health of the financial system remains in doubt and investor uncertainty continues,’ Brian Kim, a currency strategist at UBS AG in Stamford, Connecticut, wrote in a research note yesterday. Policy makers may need to expand aid to the banking system beyond the $700 billion already approved and take other measures even at the cost of soaring fiscal deficits, Bernanke said yesterday in testimony prepared for the Senate Budget Committee. Companies in the U.S. cut an estimated 630,000 jobs in February, economists surveyed by Bloomberg News predict the ADP Employer Services gauge will show today. U.S. pending home resales decreased 7.7 percent in January, more than twice the 3.5 percent drop forecast by economists, the National Association of Realtors reported yesterday in Washington. FKLI February futures contract close unchanged at 863 as compare to previous trading session with total 8027 lots traded in the market. FKLI rebound after previous strong selling activities while regional indices and Dow Jones futures electronic didn’t anticipate wild movement. 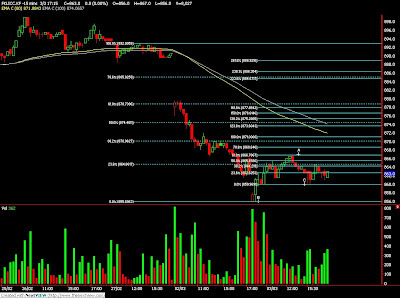 Technically, FKLI seems temporary supported on 856, 400% Fibonacci projected figure. We expect FKLI would rebound slightly higher during the coming trading session with resistances seen at 874 and 885 region. Traders were advice to hold short position in the coming trading session while be cautious around support levels at 860 and 850 regions. FCPO 3rd month May Futures contract closed RM16 lower at RM1855 as compare to previous trading session with 10529 lots traded in the market. CPO price was seen traded sideways while waiting fresh market lead CPO price to move despite crude oil plunge during overnight trading session. 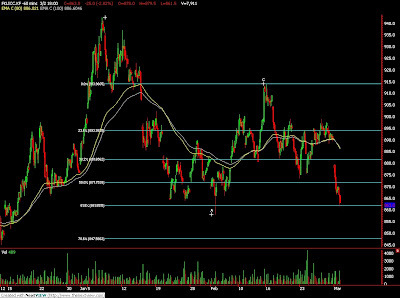 Technically, CPO price seems temporary supported above 78.6% Fibonacci retracement figures at RM1850 regions. We expect CPO price would trade higher in the coming trading session provided support levels at RM1830 and RM1850 were not violated during trading session. Traders were advice to long position in the coming trading session while be cautious around resistance levels at RM1890 and RM1940 regions. MUMBAI, March 3 (Reuters) - India soybean fell Tuesday as Malaysian palm oil prices fell and rapeseed arrivals peaked in top producer Rajasthan, analysts said. Arrivals of India's main winter oilseed crop rose to 300,000 bags of 85 kg each on Monday, traders said, compared with about 100,000 bags two weeks ago. At 11:07 a.m., April soybean NSBJ9 on the National Commodity and Derivatives Exchange fell 0.42 percent to 2,256.5 rupees per 100 kg. But rapeseed futures reversed a weak open and rose on expectations that millers will stock up to meet annual requirements and as a section of traders believe demand will pick up as spot rates have recently seen a sharper fall than soybean. Rapeseed and soybean are both oilseeds crushed to produce edible oils. However, rapeseed contains about 40-42 percent edible oil by weight, while soybean contains only about 17 percent. June rapeseed was up 0.29 percent at 442.5 rupees per 20 kg. The contract had earlier touched a new low of 439 rupees. March 3 (Bloomberg) -- Crude oil was little changed near $40 a barrel in New York after slumping 10 percent yesterday on signs the recession in the world’s largest economies is deepening, threatening further weakness in demand for fuel. Oil dropped as the Dow Jones Industrial Average slipped yesterday below 7,000 for the first time since 1997 after Warren Buffett said the economy is in “shambles” and insurer American International Group Inc. reported a $61.7 billion loss. U.S. manufacturing in February shrank for a 13th consecutive month. Crude oil for April delivery rose 3 cents to $40.18 a barrel on the New York Mercantile Exchange at 11:08 a.m. Sydney time. Yesterday, futures plunged $4.61 to settle at $40.15 a barrel, the biggest one-day drop since Jan. 7. Prices are down 10 percent so far this year. Brent crude oil for April settlement declined $4.14, or 8.9 percent, to end the session at $42.21 a barrel yesterday on London’s ICE Futures Europe exchange. The discount of oil in New York to the Brent grade in London widened to $2.06 a barrel. That’s less than the $10.67 discount on Feb. 12. The Institute for Supply Management’s factory index was 35.8 last month from 35.6 in January. Readings less than 50 signal contraction. The Dow declined 299.64 points, or 4.2 percent, to 6,763.29 yesterday. The Standard & Poor’s 500 Index fell 34.27 points, or 4.7 percent, to 700.82. Manufacturing also contracted in China last month. The CLSA China Purchasing Managers’ Index rose to a seasonally adjusted 45.1 from 42.2 in January, CLSA Asia-Pacific Markets said yesterday. U.K. manufacturing shrank for a 10th month, the Chartered Institute of Purchasing and Supply said in a report yesterday. Commodities yesterday had the biggest drop since October as the deepening global recession slashed demand. The Reuters/ Jefferies CRB Index of 19 raw materials fell 11.23, or 5.3 percent, to 200.34, the biggest decline since Oct. 10. The 6.6 percent decrease on that date was the largest since the debut of the index in 1956. Oil also declined as the dollar strengthened to the highest level since April 2006 against the currencies of six major U.S. trading partners, reducing the appeal of commodities as an alternative investment. The Dollar Index, which the ICE exchange uses to track the U.S. currency versus the euro, yen, pound, Swiss franc, Canadian dollar and Swedish krona, climbed to 88.969. Officials from the Organization of Petroleum Exporting Countries, the supplier of 40 percent of the world’s oil, gave conflicting signals on their intentions to cut output further when they meet in Vienna on March 15. The group “will likely” reduce supplies to support prices, Algerian Oil Minister Chakib Khelil said in an interview in Madrid yesterday. Earlier this week, Iran’s oil minister said OPEC is unlikely to lower crude production when it meets. OPEC members have reached almost 100 percent compliance with existing cuts at the end of February, Khelil said. The group has implemented as much as 80 percent of previously announced supply cuts, preventing a sharp fall in the oil price, Iranian Oil Minister Gholamhossein Nozari said in comments posted March 1 on the Web site of state-run Iranian Students News Agency. “OPEC has been very aggressively cutting output but has more work to do before prices will rise,” Mueller said. Gasoline futures for April delivery fell 45 cents to $1.2817 a gallon in New York today, after falling 8.63 cents yesterday to settle at $1.2862 a gallon in New York. March 2 (Bloomberg) -- Soybeans plunged to an 11-week low and corn fell for a third session on speculation that demand will decline because of the global economic slump. The MSCI World Index of equities dropped to the lowest in almost six years, Warren Buffett said the economy is in a “shambles,” and American International Group Inc. announced a $61.7 billion loss in the fourth quarter. Corn and soybeans are down 14 percent this year as consumption waned for food, livestock feed and fuel made from the crops. Soybean futures for May delivery fell 28 cents, or 3.2 percent, to $8.44 a bushel on the Chicago Board of Trade, after earlier dropping to $8.3825, the lowest for a most-active contract since Dec. 12. The price climbed 1 percent last week, ending a two-week decline. Soybeans touched a record $16.3675 on July 3, before ending the year down 19 percent. Corn futures for May delivery fell 8.75 cents, or 2.4 percent, to $3.5025 a bushel in Chicago, capping a three-day drop of 5.9 percent. Most-active futures reached a record $7.9925 on June 27, before closing the year down 11 percent. The Dow Jones Industrial Average dropped below 7,000 for the first time since 1997. The Reuters/Jefferies CRB Index of 19 raw materials fell more than 5 percent. The U.S. economy contracted at a 6.2 percent annual rate in the fourth quarter, the steepest decline since 1982, according to Commerce Department data. Pilgrim’s Pride Corp., the biggest U.S. chicken processor, last week said it will idle three U.S. plants because of a glut of poultry meat. Pacific Ethanol Inc. announced plans to close distilleries in Idaho and California because of unfavorable market conditions for the corn-based fuel. Speculators and investors may cut their net-long positions, or bets prices will rise, in both soybean and corn markets as equities continue to fall, said Gordon Linn, president of the Linn Group in Chicago. Speculators cut net-long positions in soybean futures and options by 31 percent to 19,553 contacts in the week ended Feb. 24, the smallest in four months, CFTC data show. Net-longs have fallen 87 percent from a record position of 156,188 contracts in December 2007. Index funds that invest in baskets of commodities cut net- long soybean positions by 1.9 percent to 96,188 contracts last week, CFTC data show. That’s a 52 percent reduction from 198,707 held in February 2008, the data show. In corn futures and options, index funds increased net-long positions by 2.2 percent to 229,522 contracts last week, CFTC data show. Net-long positions are down 49 percent from a record 452,568 contracts in April. Hedge-fund managers and other large speculators reduced their net-short positions in corn futures and options by 12 percent to 11,521 contracts in the week ended Feb. 24, CFTC data show. That’s up from a 37-month high of 13,117 contracts short a week earlier. Corn is the biggest U.S. crop, valued at $47.4 billion in 2008, followed by soybeans at $27.4 billion, government figures show. The U.S. is the world’s biggest grower and exporter of the crops. March 2 (Bloomberg) -- Gold fell for the sixth straight session, the longest slump since October, as some investors sold the precious metal to cover losses in equity markets. Silver also declined. The Standard & Poor’s 500 Index fell as much as 4.2 percent today, after tumbling 11 percent in February. Investment in the SPDR Gold Trust, the biggest exchange-traded fund backed by bullion, reached a record 1,029.3 metric tons on Feb. 26, after gold topped $1,000 an ounce for the first time in 11 months. Gold futures for April delivery fell $2.50, or 0.3 percent, to $940 an ounce on the Comex division of the New York Mercantile Exchange. The metal dropped 6 percent last week. Silver futures for May delivery declined 4 cents, or 0.3 percent, to $13.07 an ounce. The metal rose 4.3 percent in February. Stocks in Asia and Europe dropped, and the Dow Jones Industrial Average slid below 7,000 for the first time since 1997. Manufacturing in the U.S. contracted in February for the 13th consecutive month. American International Group Inc. posted the worst quarterly loss by any U.S. corporation and is asking the government for more help. “If stocks are under pressure, the margin clerks become active once again, and they shall look to gold as a place to raise liquidity,” said Dennis Gartman, an economist and the editor of the Suffolk, Virginia-based Gartman Letter. Still, the slide in gold prices may attract investors looking for a store of value, some analysts said. The metal has gained 6.3 percent this year, while the S&P 500 has dropped more than 21 percent. March 3 (Bloomberg) -- The dollar and the yen advanced for a third day against the euro on mounting concern eastern European nations will default, encouraging investors to seek the two currencies as a refuge. The yen may extend gains on speculation investors will bring back earnings from overseas before Japan’s fiscal year ends March 31. The Dollar Index traded near the highest level since 2006 yesterday as stocks tumbled and Hungary had the outlook on its debt rating cut to “negative” by Fitch. The euro also fell on speculation European Central Bank Council Member Axel Weber may signal policy makers will cut interest rates to combat the recession. “There is a definite sense that the U.S. dollar is attracting a safe-haven bid,” said Jonathan Cavanagh, a currency strategist in Sydney at Westpac Banking Corp., Australia’s fourth-largest bank. “It’s only a matter of time before we see some further signs of pressure” in the euro- region, he said. The U.S. currency advanced to $1.2559 per euro as of 8:50 a.m. in Tokyo, from $1.2578 late yesterday in New York. It touched $1.2578 yesterday, the strongest level since Feb. 19. The yen climbed to 121.96 per euro from 122.58 yesterday. The yen rose to 97.11 per dollar from 97.45 yesterday. The Hungarian forint dropped 3.4 percent yesterday to 244.49 per dollar, while Poland’s zloty lost 3.3 percent to 3.7895. The pound fell 1.8 percent yesterday to $1.4055. The Dollar Index, which tracks the greenback versus the euro, yen, pound, Swiss franc, Canadian dollar and Swedish krona, advanced yesterday to 89.003, the highest since April 2006. FKLI February futures contract plunge 25 points lower to close at 863 as compare to previous trading session with total 7911 lots traded in the market. FKLI plunge during trading session as regional indices and Dow Jones futures electronic plunge since market starts trading. 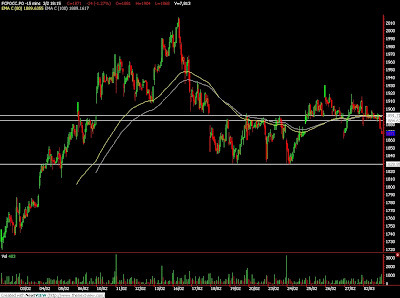 Technically, FKLI starts to plunge once previous support level at 888 was breach during the trading session. 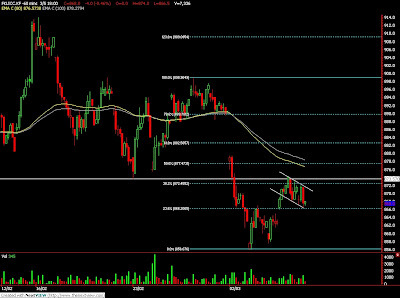 We expect FKLI would trade lower in the coming trading session as downtrend was confirm after support region at 873.5 was violated. Traders were advice to hold short position in the coming trading session provided resistance levels at 888 and 899 were not violated. Nearest support was seen around 858 and 840 regions. FCPO 3rd month May Futures contract closed RM24 lower at RM1871 as compare to previous trading session with 7813 lots traded in the market. CPO price was seen traded without clear direction despite wild price movement from soybean oil and crude oil electronic trading. Technically, CPO price seems temporary breach support levels at RM1880. We expect CPO price would trade sideways within range RM1800 and RM1900 in the coming trading session. Traders were advice to hold long position for CPO futures trading as we still expect CPO price would traded higher in the coming trading session provided support levels at RM1830 and RM1720 were not violated. 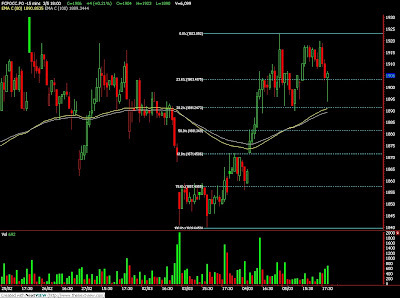 Resistances levels were seen at RM1900 and Rm1945 regions. March 2 (Bloomberg) -- Crude oil fell for a second day in New York on signs that the global recession will shutter more factories and cause increased job losses in the U.S., limiting fuel demand. An Institute of Supply Management report today may show U.S. manufacturing contracted in February from the previous month, according to a Bloomberg survey of economists. Japan’s factory output dropped 10 percent in January, the Trade Ministry said Feb. 27. The two countries account for about 30 percent of global oil consumption. Crude oil for April delivery fell as much as 76 cents, or 1.7 percent, to $44 a barrel in electronic trading on the New York Mercantile Exchange. It was at $44.13 a barrel at 8:38 a.m. Singapore time. On Feb. 27, the contract declined 46 cents, or 1 percent, to settle at $44.76 a barrel. Prices are down 1.2 percent so far this year. Futures have dropped 70 percent from the record $147.27 a barrel reached on July 11. Brent crude oil for April settlement fell as much as 80 cents, or 1.7 percent, to $45.55 a barrel on London’s ICE Futures Europe exchange. It was at $45.57 at 8:33 a.m. Singapore time. The contract declined 16 cents, or 0.3 percent, to end the session at $46.35 a barrel on Feb. 27. The Institute for Supply Management’s factory index to be released today fell to 34 in February from 35.6 the prior month, according to the survey median. A reading of 50 is the dividing line between growth and contraction. U.S. employers may have cut payrolls by 650,000, the most since 1949, and the jobless rate probably surged to 7.9 percent, according to the median estimates in a Bloomberg News survey ahead of Labor Department figures March 6. Officials from OPEC, the supplier of 40 percent of the world’s oil, gave conflicting signals on their intentions to further cut output to bolster prices when they meet in Vienna on March 15. The group “will likely” reduce supplies to support prices when it gathers, Algerian Oil Minister Chakib Khelil said on Feb. 28 in Algiers. He is the previous president of the Organization of Petroleum Exporting Countries. Yesterday, Iran’s oil minister said OPEC is unlikely to lower crude production when it meets. Crude oil, which fell to a five-year low of $33.87 on Dec. 19, has rebounded as OPEC has restricted supply. At its last meeting in December, members agreed to a record 9 percent reduction in supply targets effective Jan. 1, extending two earlier resolutions to curb production as the global economy sank into a recession, straining the budgets of crude exporters. Hedge-fund managers and other large speculators decreased their net-long position in New York crude-oil futures in the week ended Feb. 24, according to U.S. Commodity Futures Trading Commission data. Speculative long positions, or bets prices will rise, outnumbered short positions by 28,749 contracts on the New York Mercantile Exchange, the Washington-based commission said in its Commitments of Traders report. Net-long positions fell by 16,267 contracts, or 36 percent, from a week earlier. March 2 (Bloomberg) -- John Taylor says three decades of currency trading taught him financial turmoil prompts large banks to favor local lending, and that’s why he’s buying U.S. dollars for the biggest foreign-exchange hedge fund. The pound and franc will also benefit from such moves, while currencies of New Zealand and other nations dependant on international banking will suffer, said Hans-Guenter Redeker, BNP Paribas SA’s chief currency strategist in London. He predicts the dollar will strengthen about 5.6 percent to 1.20 per euro by June 30. Concerns about home-lending favoritism follow pledges by governments around the world of more than $10 trillion to prop up banking systems. More than $1.1 trillion of writedowns and losses created the worst financial crisis since the 1930s and triggered a global recession. U.S. President Barack Obama’s $787 billion stimulus plan, enacted last month, includes “Buy American” provisions. French President Nicolas Sarkozy created a fund in November to protect “strategic” companies from “foreign predators.” Russia increased duties on automobile imports in December, while India limited steel imports and imposed tariffs on soybean oil. Historians blame a trade war during the Great Depression, starting with the U.S. passage of the Smoot-Hawley Tariff Act in 1930, for deepening the worldwide economic slump. History also shows that exchange rates are vulnerable to protectionist threats, said Derek Halpenny, the London-based European head of global currency research at Bank of Tokyo-Mitsubishi UFJ Ltd. The dollar slid to a record low in April 1995 of 79.75 yen after the U.S. threatened to impose tariffs on Japan. Redeker said financial protectionism adds a layer of danger to foreign exchange markets, where trading increased to $3.2 trillion a day as international banks expanded. After posting the biggest loss in U.K. history, Edinburgh- based Royal Bank of Scotland plans to boost lending to U.K. homeowners and businesses by 50 billion pounds ($71.7 billion) as part of an agreement with the government to shift 325 billion pounds of investments into a state insurance program. Declines in the shares of financial companies helped push the Standard & Poor’s 500 Index to a 12-year low last week, on concern the deepening recession will force banks to seek more government aid. The premium banks charge each other for short- term loans, a barometer of willingness to lend known as the Libor-OIS spread, was 1.02 percentage points Feb. 27, about 10 times the average for the decade before August 2007. The dollar rose to the highest in almost three years against the currencies of six major U.S. trading partners on Feb. 27 as investors sought refuge in the world’s preferred reserve currency. The Dollar Index, which the ICE exchange uses to track the U.S. currency versus the euro, yen, pound, Swiss franc, Canadian dollar and Swedish krona, reached 88.490, the highest level since April 2006. It’s up 8.2 percent this year. Last month was the worst for the yen against the dollar since 1995 as Japan’s currency weakened 7.85 percent and ended the week at 97.57 to the dollar. The euro depreciated versus the dollar too, losing 1.2 percent last week to 1.2669. The New Zealand dollar lost 2.1 percent against its U.S. counterpart. For Taylor of FX Concepts, who worked at Citibank until 1979, today’s markets are reminiscent of the late 1970s and early 1980s. Oil prices more than doubled and the Federal Reserve lifted its target rate for overnight loans to 20 percent by March 1980 from 10 percent at the beginning of 1979, leading the U.S. into a recession that lasted from January to July 1980. The Dollar Index surged 22 percent between the end of 1979 and the close of 1981. Citigroup Inc. CEO Vikram Pandit said in a Jan. 16 conference call that the U.S. wasn’t pressuring the bank to restrict international lending. The government ratcheted up its effort to save Citigroup on Feb. 27, agreeing to a third rescue attempt that will cut existing shareholders’ stake in the New York-based company by 74 percent. Kenneth D. Lewis, CEO of Bank of America Corp., the largest U.S. bank by assets, acknowledged that helping the U.S. economy goes hand in hand with accepting federal funding. The World Bank, the European Bank for Reconstruction and Development and the European Investment Bank said Feb. 27 they will provide as much as 24.5 billion euros ($31 billion) to help central and east European banks and businesses cope with the global financial crisis and refinance foreign-currency loans. Shares of eastern European banks touched six-year lows and the Polish zloty, Hungarian forint, and Czech koruna slid after Moody’s Investors Service said in a Feb. 17 report that it may cut the debt ratings of western European banks exposed to mounting bad debts in the continent’s developing economies. The South Korean won, Australian&cls; dollar&cle;, and currencies of smaller countries dependant on trade are most at risk from a rise in protectionism, said David Woo, the London-based global head of foreign-exchange strategy at Barclays Plc. The International Monetary Fund cut its estimate for world growth to 0.5 percent in January from 2.2 percent, the weakest pace since World War II. South Korea’s economy will shrink 4 percent this year, the IMF forecasts. FKLI February contract fall 6.5 points lower to settle at 890.5 as compare with previous trading session with a total of 5271 lots traded in the market. FKLI Feb was mainly traded lower during the trading session but with narrow range as its settle day where value of the contract tracks CI closely during the trading session. Technically, FKLI seems fails to penetrate the resistance levels at 898.5; 61.8% Fibonacci figure from 914 to 873.5 after topped around 897.5 and 893 each. 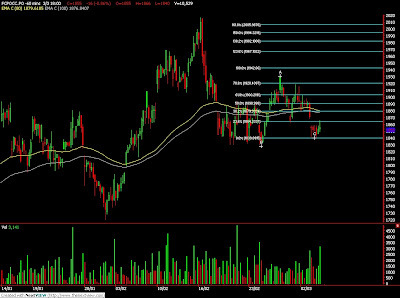 We expect FKLI would trade lower in the coming trading session provided if support levels at 888; 100 – day and 80 – day moving levels and 875.5 regions were breach in the coming trading session. Traders were advice to hold short position in the coming trading session with condition resistance levels at 898.5 and 914 must not be violated. FCPO May futures contract traded marginally RM5 higher compare to previous trading session and close at RM1895 with a total 7230 lots traded in the market. CPO price was mainly traded higher during trading session due to soybean oil and crude oil overnight firm closing figures. Technically, CPO price manage to test the support levels at RM1880 regions; 100 – day and 80 – day moving average after manage to surge up to RM1930 region during previous trading session. We expect CPO price would trade higher in the coming trading session provided support levels at RM1880 – RM1860 regions were not violated. Traders were advice to hold long position in the coming trading session while be cautious around resistance levels at RM1940 and RM1970. Feb. 28 (Bloomberg) -- Warren Buffett said crude oil will rise far above its current price and that he made a mistake when he purchased ConocoPhillips stock last year for his Berkshire Hathaway Inc.
Buffett’s Berkshire Hathaway today posted a fifth-straight profit drop, the longest streak of quarterly declines in at least 17 years, on losses from derivative bets tied to stock markets. Fourth-quarter net income fell 96 percent to $117 million, or $76 a share, from $2.95 billion, or $1,904 a share, in the same period a year earlier, the Omaha, Nebraska-based firm said in its annual report. In 2007, Berkshire reported record earnings as Buffett booked a $3.5 billion profit cashing out of a $500 million investment in oil producer PetroChina Co.
Buffett wrote today that “the terrible timing” of his ConocoPhillips purchase cost Berkshire “several billion dollars.” According to figures given in the letter, Berkshire Hathaway purchased the ConocoPhillips stock for $7.01 billion. As of Dec. 31, the stake was valued at $4.4 billion. Crude oil for April delivery fell 46 cents, or 1 percent, to settle at $44.76 a barrel at 2:50 p.m. on the New York Mercantile Exchange yesterday. Prices are up 7.4 percent this month and 0.4 percent so far this year. Futures have dropped 70 percent from the record $147.27 a barrel reached on July 11. Feb. 27 (Bloomberg) -- Soybeans rose from a 10-week low on speculation that demand for U.S. supplies will rise as farmers withhold supplies in Argentina, where the government is considering a plan to take over the country’s grain trade. A proposal for the state to buy and sell grains and oilseeds, to ensure adequate domestic supplies before any export sales, is being studied at “the highest levels,” said a government official who asked not to be named. The possible nationalization of the grain trade threatens to worsen a yearlong conflict with farmers over agricultural policy. Soybean futures for May delivery rose 3.5 cents, or 0.4 percent, to $8.72 a bushel on the Chicago Board of Trade, after earlier falling to a 10-week low at $8.49. The most-active futures gained 1 percent this week, after two straight weekly declines. Still, the price fell 11 percent for February and is down 47 percent from a record $16.3675 on July 3. Argentina is the world’s third-largest soybean exporter and is the biggest shipper of animal feed and vegetable oil made from the oilseed. The nation’s farmers temporarily halted grain and soybean sales last week to push President Cristina Fernandez de Kirchner’s government to cut export taxes on soybeans, which are as high as 35 percent. Soybean prices have fallen while the worst drought in half a century has hurt Argentina’s crops. By raising the possibility of nationalization, the government is pressuring farmers to sell the 7 million metric tons of last year’s soybeans they still hold in storage, Buenos Aires newspaper La Nacion reported today. The sales would provide $1 billion in tax revenue, La Nacion said. Feb. 27 (Bloomberg) -- Gold fell, capping the first weekly loss in three, as the dollar strengthened to the highest level since April 2006, eroding the appeal of the precious metal as an alternative investment. Silver advanced. The U.S. Dollar Index rose against the currencies of six major trading partners on demand for a haven after the U.S. bailed out Citigroup Inc. for a third time, stoking concerns that the credit crisis and the recession may deepen. U.S. stocks fell for a third straight day and the Reuters/Jefferies CRB Index of 19 commodities dropped as much as 1.9 percent. Gold futures for April delivery fell 10 cents to $942.50 an ounce on the Comex division of the New York Mercantile Exchange. That left the metal down 6 percent for the week, the first decline since Feb. 6 and the biggest since Dec. 5. Gold and the dollar generally move in the opposite direction. The correlation hasn’t held this year as demand for both the U.S. currency and gold have risen because of the financial crisis. The dollar index has gained 1.7 percent this week. Gold and the dollar last moved in tandem in 2008, when the Dollar Index gained 6 percent and gold rose 5.5 percent. Before last year, gold gained 18 percent in 2005 and the Dollar Index rose 13 percent. Still, gold may be a better bet than the dollar as U.S. government spending and corporate bailouts eventually spark inflation and erode purchasing power, some analysts say. The U.S. government has pledged more than $9.7 trillion to helping ease the recession and credit crisis. Investment in the SPDR Gold Trust, the biggest exchange-traded fund backed by bullion, reached a record 1,029.3 metric tons yesterday. Silver may rise as a cheaper alternative to gold, analysts have said. Before today, the metal had lost 31 percent in the past year while gold had declined 0.7 percent. Gold reached $1,007.70 on Feb. 20, the highest price for a most-active contract since March 18. Gold touched a record $1,033.90 on March 17. Silver futures for May delivery rose 13.5 cents, or 1 percent, to $13.11 an ounce in New York. The most-active contract fell 9.5 percent for the week, the first decline since Jan. 16. Platinum futures for April delivery rose $32.20, or 3.2 percent, to $1,085.30 an ounce on Nymex. The most-active contract fell 0.9 percent for the week, the first drop since Jan. 16. Palladium futures for June delivery fell $2.45, or 1.2 percent, to $195.70 an ounce. Feb. 27 (Bloomberg) -- Crude oil fell for the first time in four days on concern energy demand will decline, after the U.S. economy contracted faster than anticipated. Oil dropped after the government said gross domestic product shrank at an annual pace of 6.2 percent in the fourth quarter, the most since 1982. Prices also retreated as the dollar strengthened, reducing the appeal of commodities as an alternative investment. Crude oil for April delivery fell 46 cents, or 1 percent, to settle at $44.76 a barrel at 2:50 p.m. on the New York Mercantile Exchange. Prices are up 7.4 percent this month and 0.4 percent so far this year. Futures have dropped 70 percent from the record $147.27 a barrel reached on July 11. Oil rose $2.72, or 6.4 percent, to $45.22 a barrel yesterday, the highest settlement since Jan. 26. U.S. manufacturing shrank in February and confidence among consumers declined, private reports today showed. The Institute for Supply Management-Chicago Inc.’s business barometer indicated a contraction for a fifth consecutive month, while the Reuters/University of Michigan final index of consumer sentiment fell for the first time since November. Japan’s month-on-month decline in factory output exceeded the December record drop of 9.8 percent, the Trade Ministry said today in Tokyo. Household spending fell 5.9 percent from a year earlier, the biggest drop in more than two years. The U.S. and Japan are responsible for about 30 percent of global oil consumption. “We will continue to see prices fall as the depths of the economic catastrophe become clear,” said Rick Mueller, a director of oil markets at Energy Security Analysis Inc. in Wakefield, Massachusetts. The dollar rose to the highest in almost three years against the currencies of six major U.S. trading partners as the deepening recession and the third government bailout of Citigroup Inc. stoked demand for safety. The dollar gained 0.4 percent to $1.2697 per euro from $1.2744 yesterday. The Dollar Index, which the ICE exchange uses to track the U.S. currency versus the euro, yen, pound, Swiss franc, Canadian dollar and Swedish krona, reached 88.490, the highest level since April 2006. Brent crude oil for April settlement declined 16 cents, or 0.3 percent, to end the session at $46.35 a barrel on London’s ICE Futures Europe exchange. Oil prices increased earlier this week after a U.S. government report showed a drop in gasoline stockpiles and OPEC members called for further cuts in output. Ministers from the 12-member the Organization of Petroleum Exporting Countries will gather on March 15 in Vienna to discuss second-quarter supply. OPEC agreed to three supply cuts in 2008 to halt sliding prices. The 11 OPEC members with quotas, all except Iraq, cut output 3.8 percent to 25.3 million barrels a day in February, consultant PetroLogistics Ltd. of Geneva said this week. The Paris-based IEA on Feb. 11 cut its oil-demand forecast for 2009, projecting consumption will fall by 1 million barrels a day, the biggest drop since 1982. It cited a weaker economic outlook from the International Monetary Fund. The agency was set up in 1974 in response to the Arab oil embargo. Gasoline futures for March delivery fell 1.97 cents, or 1.5 percent, to settle at $1.2807 a gallon in New York. Futures settled at $1.3004 yesterday, the highest since Nov. 13. The average U.S. pump price for regular gasoline rose 0.1 cent to $1.883 a gallon yesterday, the first gain since Feb. 15, AAA, the nation’s largest motorist organization, said on its Web site. Prices have declined 54 percent from the record $4.114 a gallon reached in July. Crude oil volume in electronic trading on the exchange was 450,922 contracts as of 3:06 p.m. in New York. Volume totaled 566,268 contracts yesterday, 7 percent higher than the average over the past three months. Open interest was 1.19 million contracts yesterday. The exchange has a one-business-day delay in reporting open interest and full volume data. Feb. 27 (Bloomberg) -- The dollar rose to the highest in almost three years against the currencies of six major U.S. trading partners as the deepening recession and the third government bailout of Citigroup Inc. stoked demand for safety. The pound touched a one-week low against the dollar as consumer confidence in the U.K. held near the weakest in 30 years. The Hungarian forint and Polish zloty rose against the euro on speculation international aid will bolster Eastern Europe’s banking system. The dollar gained 0.6 percent to $1.2663 per euro at 4:28 p.m. in New York, from $1.2744 yesterday. The U.S. currency decreased 1 percent to 97.54 yen from 98.52. The euro dropped 1.6 percent to 123.52 yen from 125.52. The Dollar Index, which the ICE uses to track the U.S. currency versus the euro, yen, pound, Swiss franc, Canadian dollar and Swedish krona, reached 88.490, the highest level since April 2006. U.S. gross domestic product contracted at a 6.2 percent annual pace from October through December, the most since 1982, the Commerce Department reported today in Washington. The government estimated that the economy shrank 3.8 percent in its advance report issued last month. Under the rescue proposal for Citigroup, the Treasury Department would convert as much as $25 billion of preferred shares into common stock, the department said in a statement today. The government will make the swaps only if private holders agree to the same terms. The pound fell as much as 1.4 percent to $1.4112, the lowest since Feb. 18, after a GfK NOP index showed U.K. consumer confidence stayed near a three-decade low. More than 40 percent of British mortgage holders may see their loans exceed the value of their homes by year-end, a separate survey by GfK NOP showed. Sterling was later little changed at $1.4316. Hungary’s forint strengthened 0.7 percent to 299.75 versus the euro and the Polish zloty appreciated 1.4 percent to 4.6456 after the World Bank, the European Bank for Reconstruction and Development and the European Investment Bank earmarked about $31 billion to help central and eastern European banks and businesses cope with the financial crisis. The narrowing yield advantage of German government bonds over Treasuries will stoke the dollar’s gains before the greenback weakens again on concern U.S. borrowing is ballooning, David Woo, global head of foreign-exchange strategy in London at Barclays Plc, wrote in a note today. The dollar, which added 1 percent versus the euro in February, will strengthen to $1.23 within a month, said Barclays, revising a previous forecast that anticipated a decline for the U.S. currency. The difference in yield, or spread, between German and U.S. 10-year government notes decreased to 8 basis points, or 0.08 percentage point, near the narrowest since November. “There is a compelling case to be made that Treasuries should underperform euro-zone government bonds in the near term,” Woo wrote. “The dollar’s strength will prove unsustainable, and we expect it to come under renewed selling pressures in the second half of the year.” Barclays kept its year-end forecast of $1.45 per euro. A 7.4 percent drop in the yen versus the dollar in 2009 and an 8.2 percent decrease in the Swiss franc leaves the greenback as the only refuge from economic turmoil. Japan’s crumbling economy weakened the yen, last year’s best performing currency, by 8 percent this month, the most since 1995, when central banks bought the dollar and sold the yen to stem the U.S. currency’s decline. The franc suffered from a deteriorating Swiss financial system and threats of intervention by the central bank to push the currency lower against the euro. The yen rose today against the dollar after its relative strength index, a gauge used by traders to indicate changes in price direction, dropped to 23.27 yesterday, the lowest level since 2004. The index climbed to 27.54 today. A reading below 30 typically indicates that an asset price may rise.